Report of meeting by Tania Cherry. Port Moresby, PNG - document attached. David Millar shared the sad news of the passing of Tony Long's brother in law, Lyn Roberts. Peter Higgs shared the news that David Johnston was not present due to a hospital visit to install a stent. Peter Higgs reminded the club that Denise Steel's funeral is this Saturday 17th at Gregson and Weight and requested attending club members wear a Rotary shirt and Rotary pin. Les Pontin announced that ticket selling for the trailer raffle would commence and Currimundi Markets on Friday 23rd and at this stage more volunteers are required to fill ticket seller spots. There has been a good take up of spots on Sunday and all positions are full. 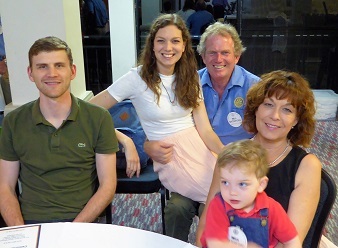 Tania Cherry sent out a call for volunteers to present Rotary Youth Citizenship Awards at our local school end of year awards events. There are a few events in early December for which we require presenters. Please let her know if you are available. It was good to see Ken Hinkley attend the meeting this week, he has been steadily improving and taking short walks around the neighbourhood - even stopping in to check on the raffle tickets sellers at Bulcock Street Market last Sunday morning. Peter Higgs shared the exciting news that Evelyn McCorkill had expressed an interest in becoming the President Elect. Monday 10th December - Barbecue for inbound and outbound Rotary exchange students at Currimundi Lake. All club members are encouraged to attend. Further details TBA. 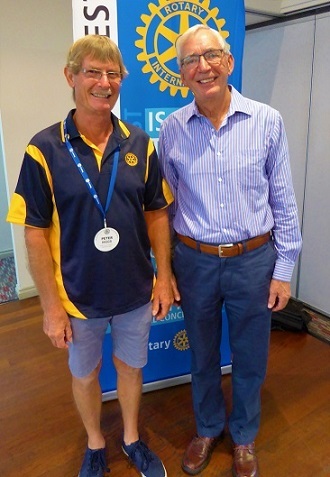 Mooloolaba Rotary Club will be commencing barbecues at the Markets at Mooloolaba Primary School on Sundays and has invited the other clubs to join the roster. Melbourne Cup themed Rikki Tikki that was won by Evelyn McCorkill. Dr Martin Radford is a retired Paediatrician who answered a 'request for doctors' advertisement in a magazine and found himself working in St Joseph's hospital, a small Catholic Mission hospital in Uganda, in a town called Masaka which is near Lake Victoria. The local people are poor but well nourished, their diet is high in carbohydrates from banana based meals and low in protein. Their typical home is simple and made from clay bricks with no running water - children collect water from the nearby lake. The land is green and fertile and subsistence farming is common, with excess produce sold from market-like shops. St Joseph's hospital appears modern from the outside. When you arrive you are greeted by a very good nurse that acts as a 'triage nurse' and sits on an elevated chair at the entrance of the hospital where the waiting area is. Inside the hospital the rooms are dark with small windows to combat the heat of the sun. There were approximately 50 beds but there were always more than 50 patients. Patient care is divided in to 3 stages - doctors provide medical care, nurses provide nursing care and families provide general care. Nurses are trained locally and live in the compound. They are well trained in procedures to a very high standard. Doctors are on short supply but are usually trained in the local university, Makerere. Clinical Medical Officers are used to fill the gap. They complete a 3 year course that is similar to the clinical teachings for medical students but with only basic medical science. They can convert to a doctor with a further 2 years training but will only be allowed/recognised to work in Uganda. Malaria is the most common illness in Uganda, with over 1 million deaths per year in Africa. There is no vaccine and mosquito eradication programs are not an option. Plasmodium Falciparum is the most common type of malaria. It is severe, non-relapsing, but patients can get it more than once. Children 6 months to 5 years are the worst affected group and they have a high mortality rate. Subsistence farmers who plant crops during the wet season are also at high risk due to the increased mosquito presence. The second most common illness Dr Radford encountered was Kwashiorkor which occurs due to the lack of protein in the diet. Symptoms include peeling skin and it is treated with a carefully monitored high protein diet. The hospital has set up a kitchen with basic utensils and equipment to provide education for parents about nourishing meals to support the treatment they provide. Dr Radford also discussed the high rate of fistulas that are still going untreated in Africa. Young women marry early and get pregnant; their child dies in utero resulting in a fistula; the fistula goes untreated and they are ostracized from the community. He mentioned the Addis Ababa Fistula Hospital in Ethiopia which was set up by doctors Catherine and Reg Hamlin in 1975. We saw pictures from a leaflet about fistulas that the hospital distributes to educate young women about the causes and prevention. The presentation closed on a humorous note with pictures of shop/site on the equator line where the owner was educating tourists who wanted to know - "which way does the water go down the toilet at the equator?"